It is a true that local habits and customs tend to fade away in our modern day lifestyle. However, in Naxos, and especially in the mountain areas, these local customs remain and retain much of their original form and meaning. This is partly due to the geographical isolation of the area and the fact that communication between the villages and the main town of Hora up till the ‘60s-, was difficult, being only possible by mule or donkey along narrow paths. «Apokria» (The carnival period which leads up to Lent, before Easter). If you happen to be on Naxos during the time of the Apokria will have the pleasure of enjoying the festival blessed by the god Dionysus, which comes to a head on the weekend before Shrove Monday. On this last weekend, celebrations are held in most of the village squares: proper feasts in which you can savour the traditional food, the plentiful wine and the music. In Apeiranthos there is great commotion and excitements when the Koudounati (the bell ringers) appear dressed in a peasant’s hooded cloak, and storm the streets of the village shaking their bells accompanied with cries and shouts. On Shrove Monday the villagers, chiefly in the villages of the Livadi area, dress up in skirts, colored ribbons and gold coins, and dance in teams in the squares. These folk customs involving masquerade probably originate to the times of the ancient Dionysian festivals. So it is no coincidence that these customs of the Apokria take place during the same season as the ancient Greek festivals, the Dionysian springtime. 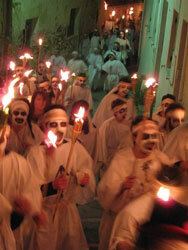 In Chora festivities are organized, where street performances take place mimicking ancients Dionysian rituals. The First of May. 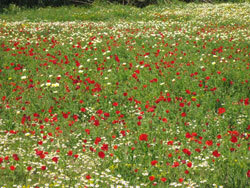 On the first of May people usually go out into the nearby countryside to collect flowers. With these flowers you are supposed to make a wreath - called the May - and hang it above the entrance to your house, as it is believed to bring good fortune. Klidonas. On this night, the 23rd of June, the locals light up the bonfires of St John and burn their May wreaths. Young people and children must leap over the fire three times. In general, a lot of young people take part in the Klidonas night, which is followed by a festival of singing and dancing in the village square. According to Greek folk tradition, fire has the power to ward off of evil spirits, sickness and all evil. 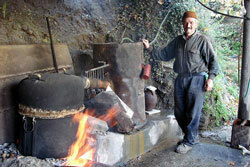 Trigos - Rakitzia (Hadjanemata) (Wine and raki making vintage festival). At the beginning of autumn, the Trigos is a period of great excitement. The wine barrels are being prepared- cleaned, repaired -, while men, women and children gather in numbers at the vineyards to gather the precious fruit. Then the grapes are processed in the traditional way: in a great barrel (called Linou) they are squashed by the bare feet of the revelers. The juice is then left to ferment in barrels too become sweet wine, which the ancients called pausilipos, i.e. bringing an end to sorrows.